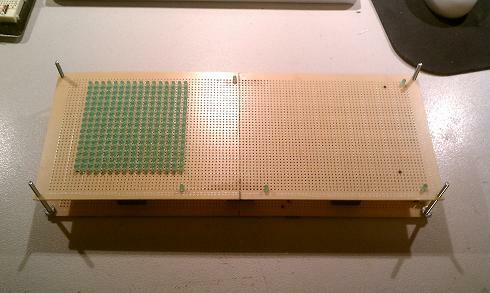 Ever since I created the 8x8 Led Matrix I wanted to create something bigger. 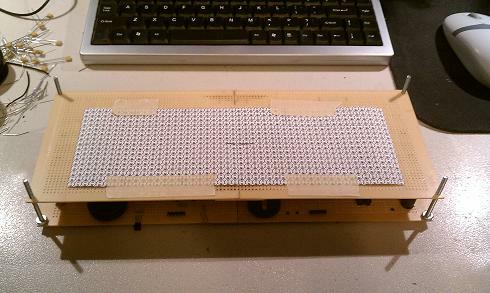 This LED matrix is 16 x 48 LEDs in size. 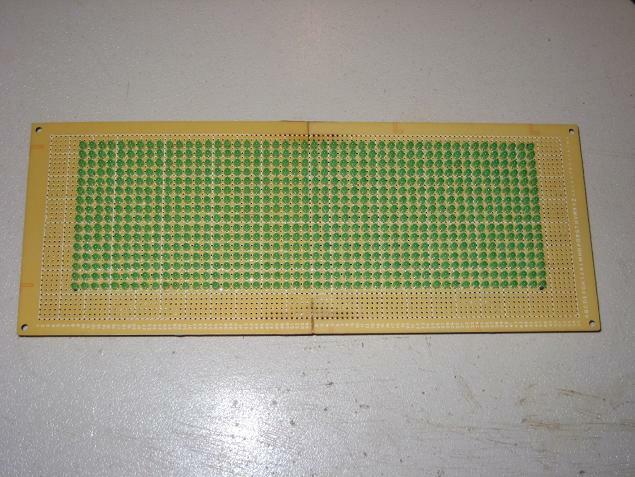 There are 768 individually placed and soldered 3mm green LEDs. Using expressPCBs free layout software I figured out how I wanted the matrix to look. I tried a few different iterations of column/row numbers before I arrived at the final 16 by 48 layout. In order to get create a board to hold all 768 LEDs I epoxied two of the 4" by 6" proto-boards from Radio Shack to make a 4" by ~10" proto-board. I printed the conceptual layout of the LEDs out so that I could and idea of what they would look like. I placed the extra LEDs around the perimeter to help the board lay flat when soldering. After many hours of soldering here is the complete LED board. 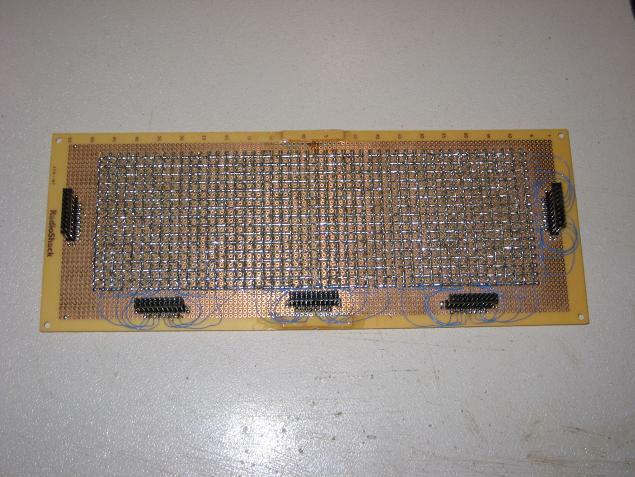 Each LED has roughly 4 solder joints for a total of 768x4 or over 3000 solder joints!!!! One of the big issues that I had while soldering was that the board was actually curving as the solder cooled. I had to hold the board flat while the solder cooled to prevent the curvature from becoming to bad. That is a lot of soldering. I linked the rows and columns to the control board with 2x10 headers. 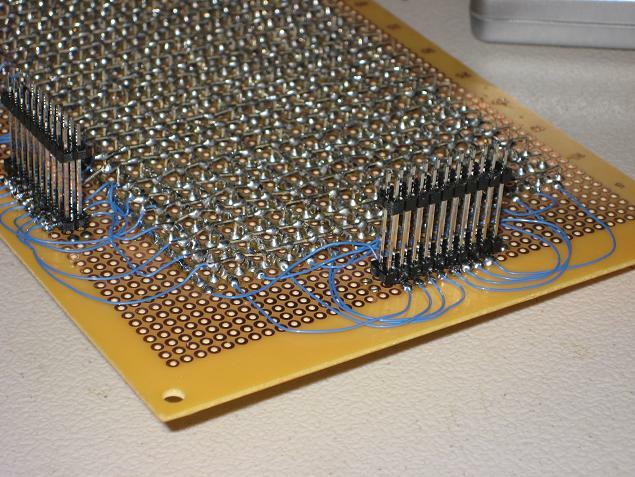 30 awg wire was used to link the individual rows and columns of the matrix to the 2x10 pin headers. The header pins were bent 90 degrees so that I could surface mount them. I only needed 16 of the 20 pins. 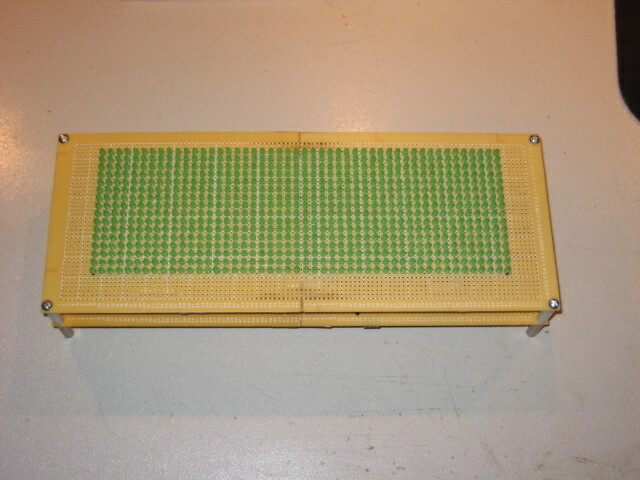 The last two pins of each header were used for alignment and support. 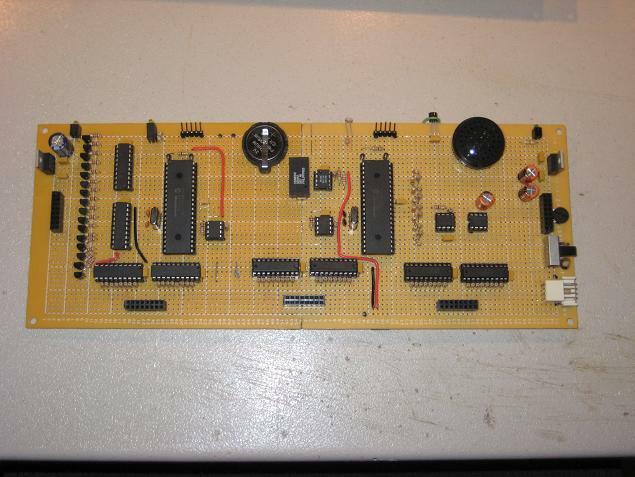 The pads on the Radio Shack boards are known for falling off and I was concerned about and torque pulling pads off. 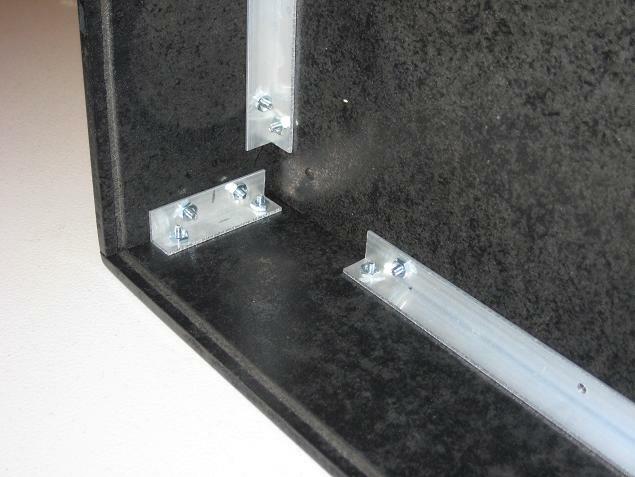 The stacked headers are designed to give 3/4" from board surface to board surface. The control board has a female header that is ~.25" giving 1" between boards. 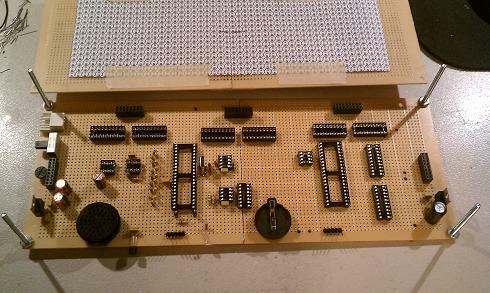 Just like the LED board I used expressPCB to layout the control board. 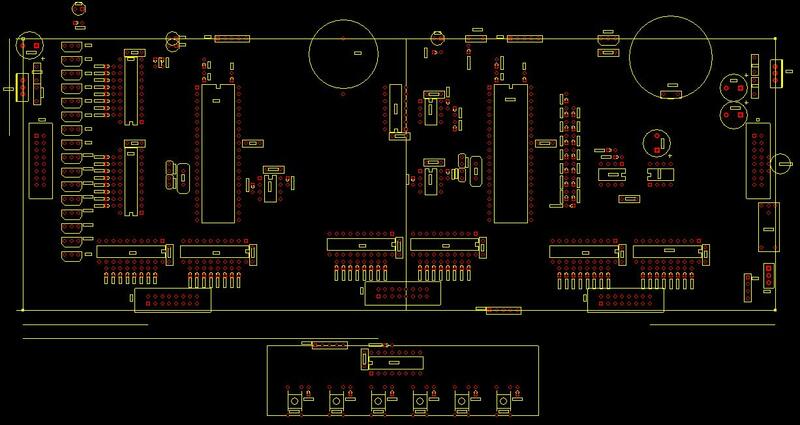 The control board houses the microcontrollers, latches for the LED matrix, real time clock, temperature sensor, LDR, 8-bit resistor DAC for audio, LM386 audio amp, speaker and EEPROMs for image/data storage. Here is a picture of the control board with all the IC sockets mounted. You can see the two 40 pin sockets for the PIC18F452s, the socket for the RTC backup battery, the 20 pin sockets for the eight 8-bit latches, sockets for the RTC and SPI eeproms and the sockets for the LM386 and LMC660 for the audio circuit. The input power plug on the upped left hand corner was pulled from a 3.5" floppy drive. 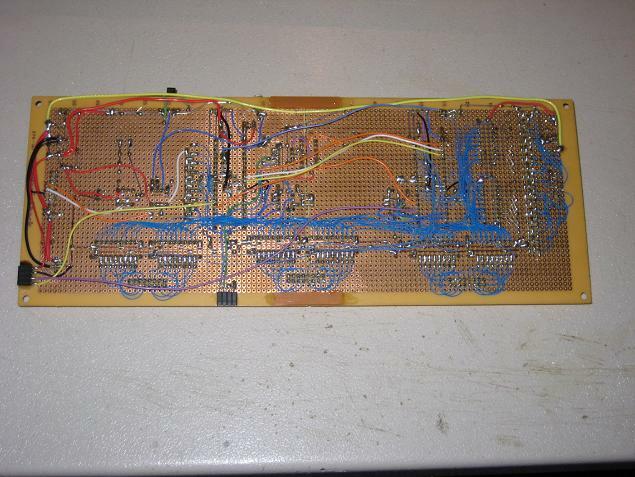 Here is a picture of the completed control board with all the ICs mounted. 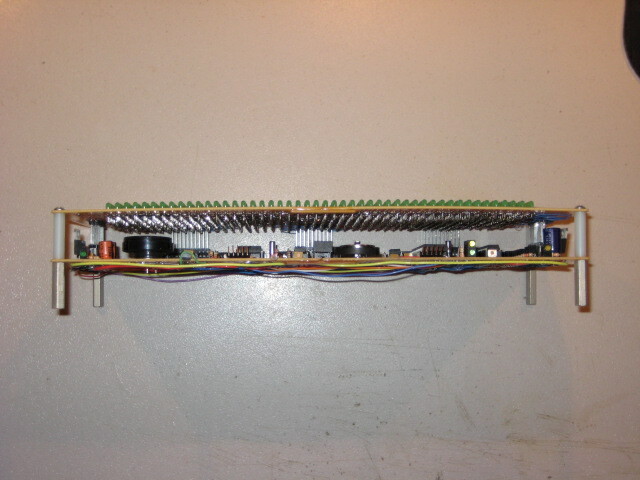 Here is a picture of the completed control board with all the ICs mounted. 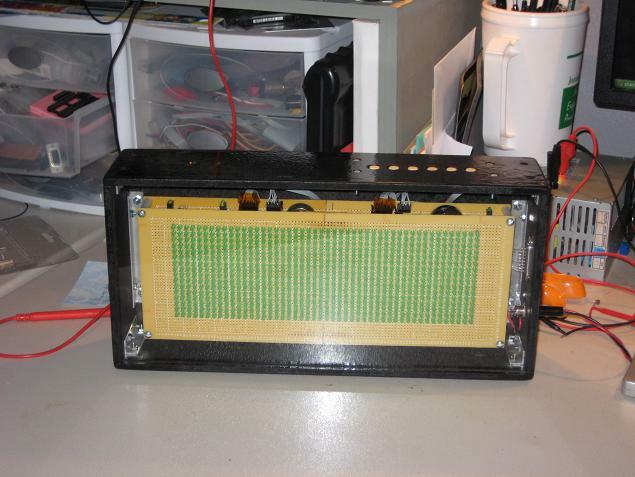 The 8-bit bus for the latches was a real pain to wire up as each pin in the chain had two wires attached to each pin. 30 Awg wire wrap wire was used for the bus. If you look at the LED board on the right side you can see the curvature caused by the cooling of the solder. I was able to correct most of it but some of it still remains. Fortunately you can't tell that it is curved when you look at it from the front. 1" nylon spacers are used to space the boards apart. The hex spacers are used to hold the boards in the case that I made for it. The case is made from 1/2" MDF panels. I was going to glue the whole thing up but since I didn't get the cuts straight enough I just used aluminum angle and screws hold everything together. Using my trusty Dremel I cut an 1/8" grove in the side and top panels to accept a sheet of Lexan. Since the Lexan is actually slightly less the 1/8" there is enough wiggle room for alignment of the panels. 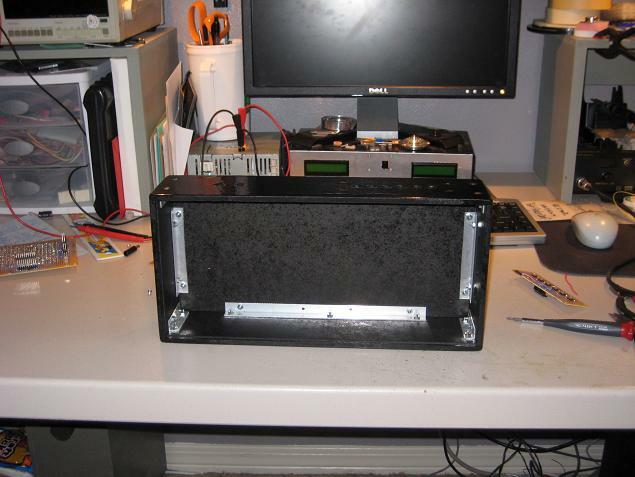 The case was painted with gloss black spray paint. In order to be able to gain access to the electronics the nuts that hold the top panel on are glued to the aluminum brackets. This allows the top to be removed for servicing. 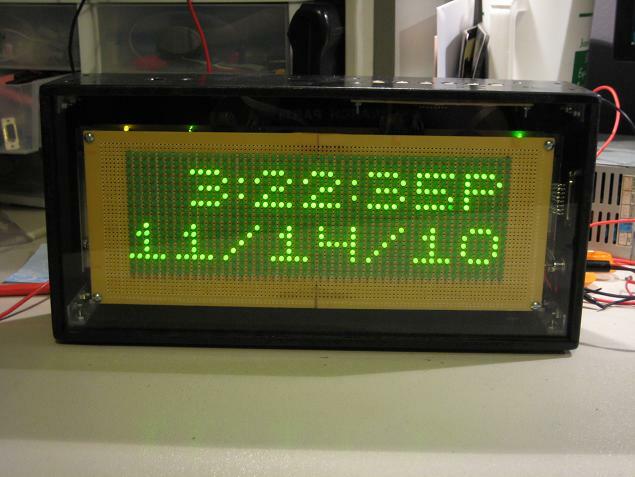 Six buttons on the top provide the user interface for setting the time and date and interacting with the display. 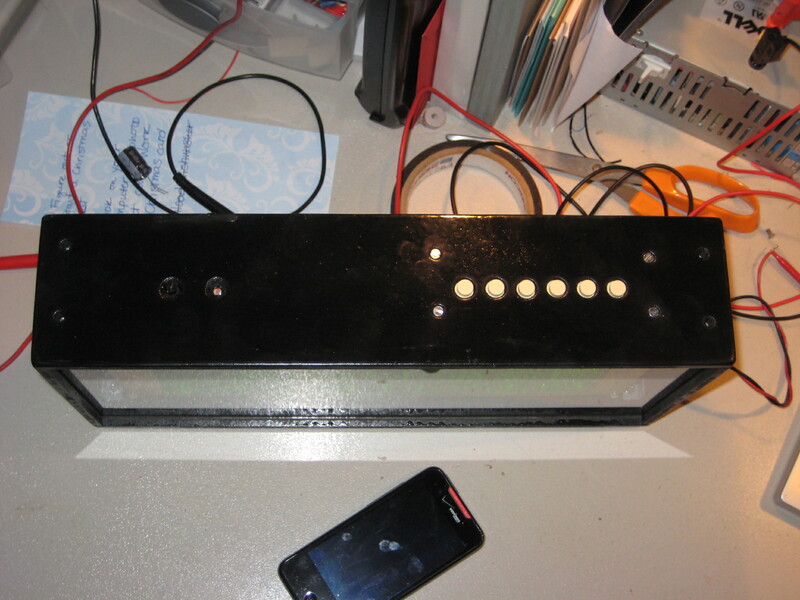 On the left side of the top panel are the temperature sensor and the CDS cell. The CDS cell allows the matrix to shut itself off when the lights in the room are turned off.